43002 Sir Kenneth Grange very slowly passes Grove on 12 July 2018 with the 1A79 06:47 Penzance to Paddington GWR service, passing the ex National Power wagons of the 6M20 09:23 Whatley Quarry to St Pancras (Churchyard Sidings) stone train, led by 66137, which inexplicably was being let out of the relief line in front of the HST! 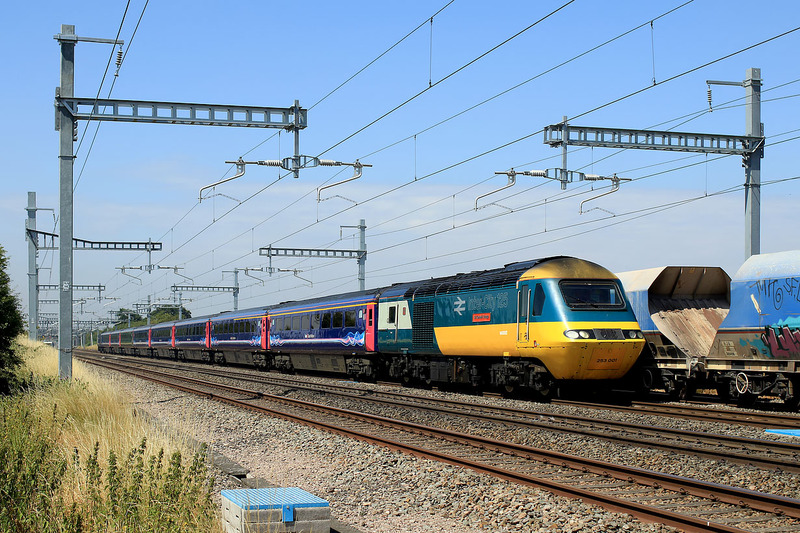 The HST came to a stand a little further on, while the slow moving freight headed off towards Didcot. At this point both trains were doing about 40mph, so there was no way that I needed the 1/2000sec shutter speed that I had set the camera to, thinking that the HST would be overtaking the freight at speed as it passed me!